Champagne toast: Atlas 25 features blush tinted lenses in a champagne acetate frame. Polished gold side inlays complete this rich look. Awesome Atlas: Atlas is a bold, modern acetate frame with round lenses and a strong arch on the brow. Each frame is meticulously handmade in Japan and features high-quality shatterproof lenses with 100% UV protection. The Atlas shape was designed to be flattering on all faces. Its super-durable construction and smooth, high-quality hinges ensure these will be your favorite shades for years to come. 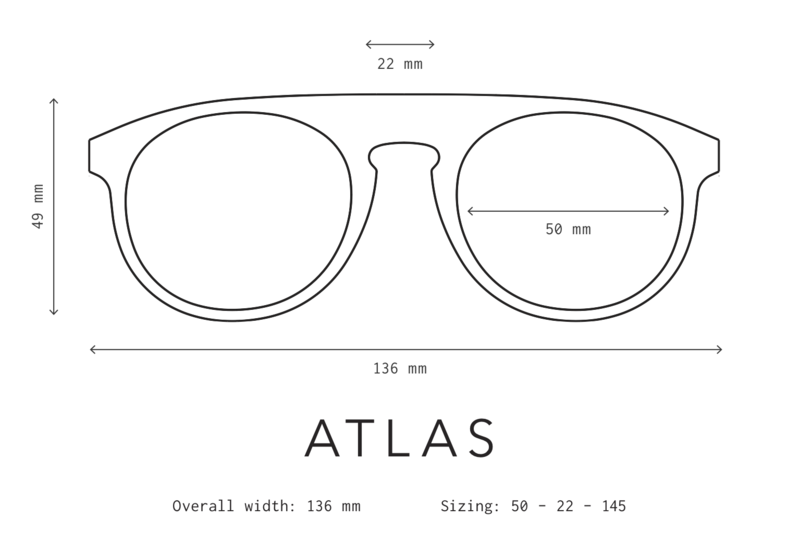 Design the Atlas to fit your style! Until the 18th century, the rocks of Gibraltar carried a warning: "nec plus ultra" (there is nothing beyond here). The idea of a circular planet began with the age of discovery and Magellan's circumnavigation of the globe...though we later learned our world was ellipsoidal, not spherical. With its gently sloping downward curve, the top line of our Atlas frame pays tribute to planetary explorers and limitless horizons.